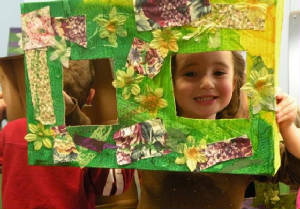 Click the photo to see the children's projects! "Passion does not arrive on videotape or on a CD; passion is personal. Passion is lifted from the earth itself by the muddy hands of the young, it travels along grass-stained sleeves to the heart. If we are going to save environmentalism and the environment, we must also save an endangered indicator species: the child in nature." "Bergen Community College’s green initiatives focus on renewable energy, sustainability education, campus and community workshops, workforce partnerships and collaborating with Bergen County for a sustainable future." Through various activities and long term projects,the children of the Child Development Center are developing a meaningful relationship with nature and an understanding of sustainable practices. They enjoy collaborating with the Green Team,the Horticulture Department and other campus and community partners. 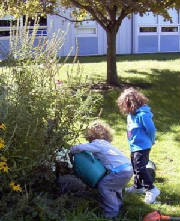 The youngest members of our college community have been joyfully learning to become stewards of the earth. The children would like to share their discoveries with you......Visit this website..then visit them in person. Please be sure to sign their guestbook and leave them a message before you leave. Look for the children's recycling lids around campus!